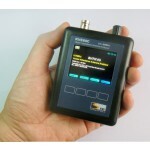 Features and Functions: The KVE520 breaks the size barrier for RF-analyzers by delivering user-friendly convenience, top-notch accuracy, and a vivid TFT multi-color display in an ultra-compact package. 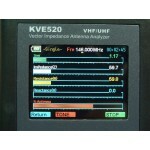 Although small in size, the KVE520 is loaded with a great selection of Single- Frequency and Swept-Frequency VNA functions. Use the Single-Frequency mode to view Standing Wave Ratio (SWR), Resistance (R), Reactance (X), and Local Interference levels (S) simultaneously on a high-resolution analog bar-graph display. High-accuracy numerical values for SWR, R, X, and Impedance Magnitude (Z) appear on the same display. 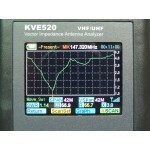 This mode also allows you to use your analyzer as a precision signal generator. Use the Scan-Frequency Mode to graphically plot SWR, R, X, and Z. All four plots are captured as a sequence of sharply defined color graphs. Simply toggle through each screen for a complete visual analysis. There's also a tunable marker on each screen you can use to call up precise numerical values for SWR, R, X, and Z at any point along the plot. 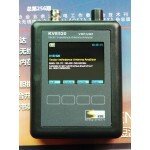 The KVE520 has internal memory, so there's no need to worry about lost data -- if you turn your unit off, the last measurement will still be there when you turn it on again. 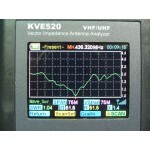 Strength Indicator to warn when high interference levels are present. USB port on your computer or USB wall charger to recharge. 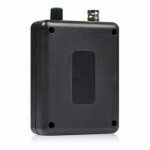 A built-in smart-charger with LED status monitoring let's you know when the analyzer is ready to go. Once you're up and running, you'll quickly discover the KVE520 has many user-friendly features including soft-menu labeling for the command keys and a built-in 8-page Help Menu. 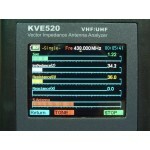 Don't forget to personalize the KVE Antenna Analyzer Boot Screen by entering your call letters or name. 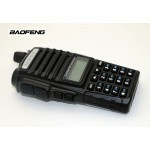 1 Display and protective glass: Sharp Transflective TFT, 1600 million color, QVGA. Mitsubishi hardened scratch resistant acrylic protective lenses.